Because it’s the new Cracow, which used to be the new Prague — which means you can expect a gorgeous fairy-tale old town buttressed with flamboyant burgher houses. Get there before Euro 2012 kicks off and England fans twig its beer-for-a-quid party potential. 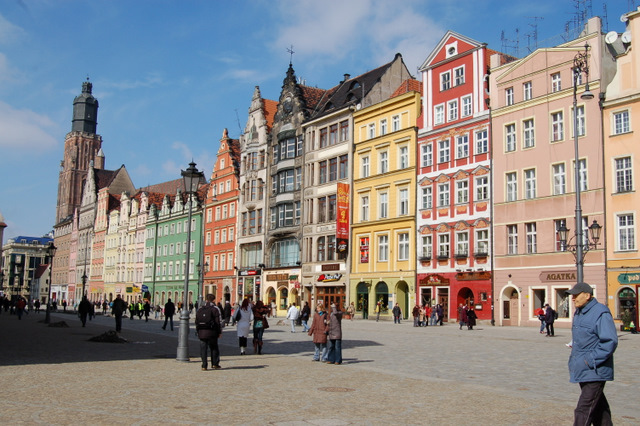 Poland’s fourth largest city doesn’t ask you to work too hard. Yes, it has an art gallery, a history museum and a cathedral. But, given that the headline attraction is a wraparound cyclorama of the battle of Raclawice, the other sights are, erm, “optional”. Freed from museum-ticking, you can relax into the Rynek, the second vastest medieval square in Europe, jostled by bonkers baroque mansions in ice-cream colours: peach, pistachio, plum. You may find that it takes you all weekend just to walk across it, especially if you stop at every cobblestoned cafe and cubby-hole bar. In the middle rises the town hall, writhing with monsters, slaughtered dragons and drunken knights. By night: Wroclaw’s oldest tavern, Piwnica Swidnicka (Rynek Ratusz 1), occupies the cellars of city hall, as it has since 1273. Inside, it’s all ye olde heraldic shields and guttering torches, and the place is rammed with carousing locals. Same goes for Spiz (Rynek Ratusz 2), where copper mash tuns twinkle in the gloom and the staff, like mad chemists, decant seven sorts of ale into 20-litre test tubes, tapped frothing at your table. The essential Polish bean feast is served at Karczma Lwowska (Rynek 4; lwowska.com.pl; mains from £6), with hunks of meat sizzled on a brazier, and bread and dripping as a mandatory starter. For rib-sticking nosh in more refined surroundings, try JaDka (Rzeznicza 24/24; jadka.pl).